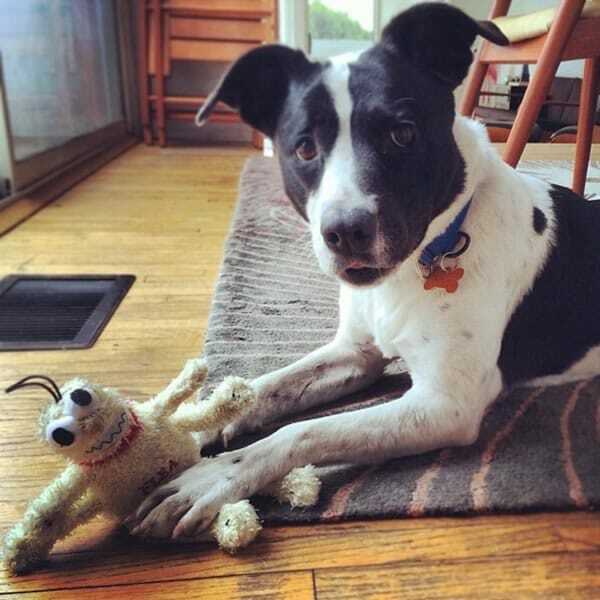 Home » Happening Now » Meet Molly. Ever since Molly joined our family a little more than a year ago, I’ve been wanting to tell you all about her… but never quite seemed to get around to it. Well, it’s time to fix that. This post has turned into a rather long one — but I need to write this for my own peace of mind, and maybe you’ll get something out of it too. Thanks for reading. Matty and I adopted Molly on November 10, 2013. We went to an adoption fair organized by No Kill Los Angeles and the Best Friends Animal Society. NKLA is a consortium of dozens of animal shelters and rescues in Los Angeles, working together to make LA a no-kill city by 2017. They’re making wonderful progress, are actually ahead of schedule! If LA can be a no-kill city, then every city can. We didn’t want a puppy, opting instead for a dog that’s a few years old (and hopefully potty-trained already!). When we told one of the volunteers what kind of dog we were looking for, what our activity level is, etc., she asked how we felt about adopting an older dog. 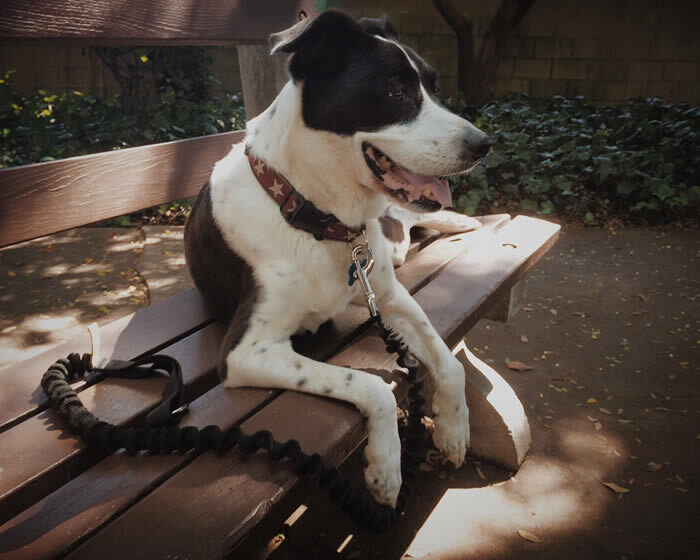 She brought us to “Pixy,” a quiet black-and-white mix who had been at the shelter nearly two months. 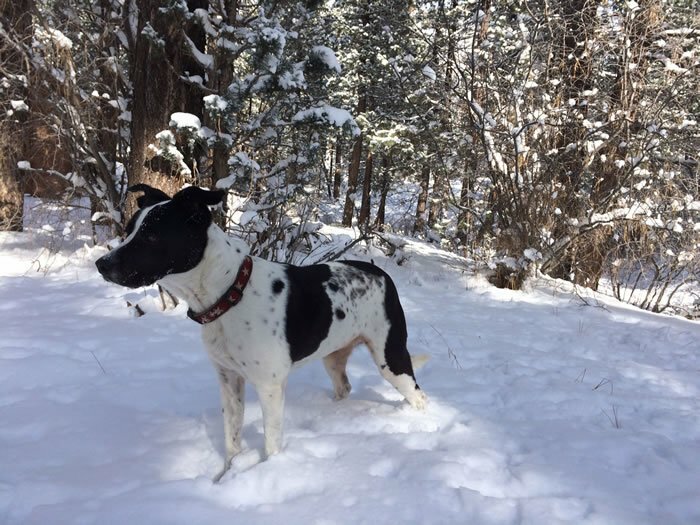 She was six years old, which gave me pause — that’s several fewer years that she’d be in our lives — but my mom wisely reminded me that the point of rescuing a dog is getting one no one else wants. As we filled out the paperwork, six or seven volunteers came over to say good-bye to her. One of them actually had tears in her eyes. Clearly, this was a special dog. We felt that the name Pixy didn’t really fit her, and she didn’t respond to it, so we decided instead to name her Molly. I like to say that Molly came “pre-trained.” She was potty-trained, and knew how to come, sit, stay, and “gimme paw.” When walking on leash, she stays on the inside of lamp posts, parking meters, and trees (lest the leash get caught up), and if the leash ever got tangled under her feet, I’d just say “paw” and she’d raise her paw to let me maneuver the leash out from under her. I even once said “Go to your place,” pointing at her bed, and she went right over and lay down. As you might imagine, we are very particular about the food we give Molly. I wanted to be sure it was high quality and nutritious, of course, but also that the animals for the meat in her food were humanely and sustainably raised. That’s how we eat, and it doesn’t make sense to me to raise food animals cruelly, just to feed to another animal. Thankfully, there are now many brands that meet that criteria. We started with The Honest Kitchen. I called them and discussed where they sourced their meat (and then decided the Turkey was the best option, since the Honest Kitchen staff had personally visited the farm and could confirm the turkeys actually got to go outside in the pasture.) Molly really liked that food — until maybe a month later, when she didn’t. We then switched her to one of their other varieties, and that went well for a little while. But then she started rejecting that, too. Molly did well on the Ziwipeak for a while, but then started rejecting that, too. We started to fall into a pattern: She’d eat well for a few weeks, then start resisting her food, and then within a day or two, would throw up. After a particularly bad episode, one veterinarian recommended boiled chicken and rice, so I went to our farmers market and bought a whole chicken. Quartering it and cooking it in our pressure cooker, I then used the leftover water to cook the rice. We did this for a few weeks, and although it was a hassle (and expensive — though probably no worse than the food from New Zealand! ), it seemed to be going well. And then I made a batch of food that came out a bit more gooey. The rice was too moist and sticky. Molly started resisting it after a day or so, and then on Sunday morning we found her standing in the backyard, drooling excessively. We brought her to the ER, and an X-ray showed a huge ball of food in her stomach. It just globbed up in there and didn’t want to move out. Clearly, cooking from scratch didn’t work out so well. The vet prescribed some motility meds, and that cleared things up. And so it continued. She’d be good with a food for a few weeks, and then she wouldn’t be, so we’d change it up. And so it went. Molly, you’re barking up the wrong tree! 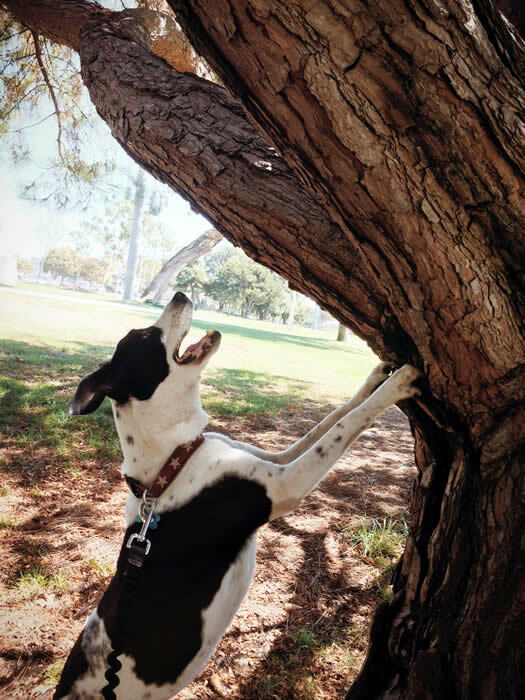 The squirrel already got away! Part III: The first diagnosis. In July, she started rejecting the Ziwipeak Lamb, so we started giving her Stella & Chewy’s lamb patties instead. We transitioned her over the course of a week, and on the first day that she ate only the new food, she had both diarrhea and vomiting. In that particular case, it might have been food poisoning (Stella & Chewy’s is raw, which I didn’t realize until later), or it might not, we’ll never know. At Dr. Bruyette’s suggestion, we gave probiotics a try, but they weren’t particularly effective (or at least not fast-acting enough). So, about two months ago we finally decided to do an endoscopic biopsy, which confirmed she has Irritable Bowel Disease. Dr. B. prescribed budesonide, prepared by a compounding pharmacy, since it’s actually a steroid for people with asthma. Things were going okay for another few weeks, though she did have the occasional vomiting episode. Then, she started rejecting her food again–by this time we were feeding her Wellness Whitefish & Sweet Potato. Matty brought her back to the hospital. An ultrasound showed a gray mass, so Dr. B. took another X-ray and found tons of little white bits in her stomach. It looked like kitty-litter — but we don’t have a cat, and Molly’s not the kind of dog that “gets into things.” She’s a very well-behaved girl. Molly had been throwing up in our side yard, which is basically a walkway with sand and fine gravel, and then eating some of it back up and ingesting the gravel. And then the gravel just clumped in her stomach. We started giving her motility drugs to help her pass the gravel, but after two and a half weeks — and two more X-rays to track the progress — we realized it wasn’t working. With her stomach half-filled with gravel, she was losing weight. She was now down about six pounds from her healthy weight of 43 pounds. She was wasting away, and the clock was ticking. If it’s not already obvious: We absolutely love this dog to bits. She’s like our daughter. We’ve kind of become those crazy dog people — perhaps it’s a way of compensating for not (yet?) having a child when many of our friends do. But really, she’s just an awesome dog — intuitive, smart, playful — and we are simply nuts about her. So back to the story. The only solution left for the gravel was surgery. So on February 18, Dr. Mueller opened her up and removed the gravel. Dr. Bruyette had warned us that there may be an issue with her pylorus, the muscle that controls the emptying of the stomach into the duodenum. It could be abnormally small, or it could be scarred, or I-don’t-remember-what-awful-else. They were going to diagnose it during surgery and then repair it if necessary. Turns out, her pylorus was fine. But during the surgery, they found a tumor on her pancreas, an enlarged lymph node next to it, and a bunch of little white nodules on her liver. They removed the tumor and the lymph node, and biopsied the liver. We got to bring her home the next day, and although she was a little worse-for-wear, she was in pretty good shape. She even got to wear a very cute t-shirt instead of the dreaded “cone of shame.” Thank goodness for small victories. Part V: Bad news. Twice. Molly was on the road to recovery. In the mornings she was obviously in a bit of pain, but that was to be expected, and the tramadol helped get her through the first couple of days. On Saturday I spoke with Dr. Yoshimoto (he joined “Team Molly” during her gravel troubles), who had the misfortune of having to be the one tell us that the biopsy came back positive. It was a neuroendocrine tumor that started on her pancreas and had metastasized in her liver. It’s officially what we were dreading: Cancer. The next day, Sunday, February 22, she refused to eat or drink. That night I had to resort to using an eye-dropper to get some water in. She’d lick the water from the dropper, but couldn’t be bothered to drink for herself. On Monday morning, she was still in the same lethargic state, so I brought her in to the hospital. It’s a good thing I did: Dr. Boyd, our newest addition to Team Molly, ran a few tests and quickly determined she was anemic — her red blood cell count was dangerously low. Dr. Boyd said there were only two options in front of us. First, we could try a blood transfusion. We didn’t yet know the cause of the anemia — if it was due to the cancer, it might only buy us a day or two. That sounded incredibly drastic to me. But the only other option was even more drastic: euthanasia. So we proceeded with the transfusion. She received two units of blood, and that night we brought her home, all of us feeling a little better already. By Tuesday morning, her tail was wagging and she was the most energetic she’d been in several weeks. 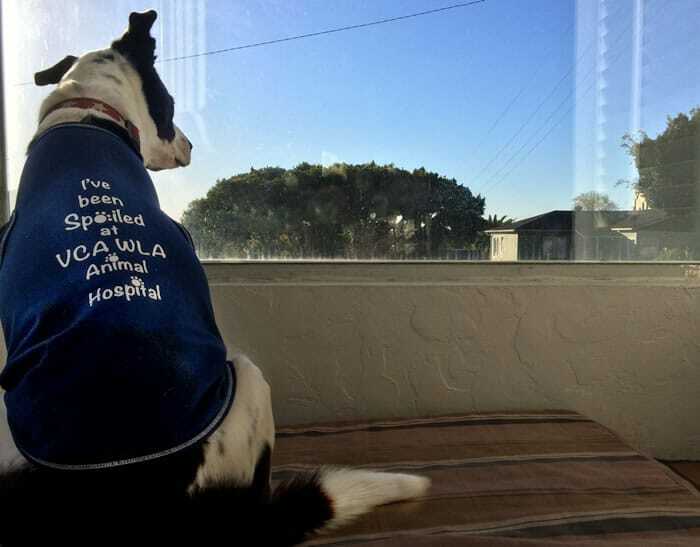 Dr. Boyd and the team at the VCA hospital quite literally saved Molly’s life last week, and even if it means we get only a couple more weeks with our girl, I will be eternally grateful. The blood work came back a couple of days later, confirming that the anemia was most likely blood loss from an ulcer (makes sense, considering her stomach had been filled with sand and grit for several weeks!). The team prescribed sucralfate to treat the ulcer, metoclopramide to help with motility, ondansentron for nausea, and pepcid and prilosec to help reduce her stomach acid. Part VI: We don’t know what we don’t know. I’ve learned a lot about pancreatic cancers in the past week. They’re not particularly well-studied in dogs, but they are in humans, and it seems they follow a similar trajectory. Neuroendocrine tumors can be active or inactive. The active ones are called that because they actively produce hormones. Some varieties can affect insulin production (and therefore blood sugar) – but Molly doesn’t have those symptoms. Another type, gastrinoma, can affect stomach acid production, and that fits her symptoms perfectly. Apparently, a gastrinoma is an uncommon sub-type of an uncommon cancer. That’s a pretty bleak prognosis, to say the least, and I’m refusing to simply accept it. We don’t know how long Molly has had this cancer. What we do know is that these types of cancer can cause digestive issues exactly like what we’ve been seeing in Molly pretty much since she joined our family. So it’s entirely possible that this cancer is growing much more slowly than usual. Although we didn’t catch it “early” (it has metastasized, after all), I’m hopeful that it’s moving slowly and we can find ways to buck the odds. Loving the snow on New Year’s Eve. Part VII: Bouncing back. And then not. Our first priority is getting Molly recovered from surgery, stable, and regaining weight. She continued to improve over the next few days after the transfusion. The diagnosis and treatment of the ulcer was spot-on, and she has been eating well. We started again feeding her chicken and rice (“Step 4” skinless chicken breasts from Whole Foods, Organic Basmati rice from Lundberg Family Farms…), and have been feeding her three times a day. However, in the past couple of days, she’s developed some diarrhea. I don’t want to get too graphic here, so I’ll just say it’s not insignificant. Yesterday Drs. Boyd and Yoshimoto prescribed metronidazole, and at this point we’re hoping it’s just an IBD flare-up rather than something to do with the cancer. As I write this, our sweet Molly is resting comfortably next to me, and has a much stronger appetite than yesterday. That’s a good sign. Hopefully the metronidazole will get us back on track. And she darn-well get better soon — we’ve got an appointment on Thursday for Dr. Mueller to take her sutures out. And as soon as they’re out, we’re going for a bath. We don’t know what’s in store for our sweet Molly, but I do know that we cherish every moment with her. She nearly died last week from the anemia, and it feels like she’s on borrowed time. We’re going to let her comfort guide her treatment — it doesn’t sound like chemotherapy is worthwhile (due to both the discomfort for her and for the price tag) — but as long as her tail is wagging, we’ll be smiling. And now, it’s time to start researching more options. We may pursue acupuncture, herbs, and other supplements. I want to revisit the probiotics. I’m just starting to dig into all this, so if any of you have suggestions, by all means please let me know in the comments. I’d also like to express my thanks to Team Molly — Doctors Britto, Bruyette, Yoshimoto, Mueller, Boyd, and Chretin. I’m confident — and crazy-grateful — that Molly has the best medical care possible. We’re blessed to have all of you helping our girl. Thanks for reading this far – I’m impressed you made it! We do have one last request for right now: Please keep Molly in your thoughts and send positive, healing energy her way. She likes it when you do that, and so do we. We give her filtered watered, but I hadn’t considered alkalized water. I will definitely look into it – thanks! Molly is such a sweet girl and I can feel the love you have for you from your beautiful words you have written. I don’t have any advice but I will keep you all in my thoughts. Your thoughts and kind words are indeed helping us. Thanks Jess! Molly is beautiful, Andrew … and so are your words! Sending you both lots of warm fuzzies and positive vibes! Thanks ladywild! It sounds like you have a wonderful pup indeed. I read every word, Andrew. It is unbelievable what the three of you have been going through. I agree that perhaps Molly had had the cancer for some time. Perhaps her eating problems are what led to her ending up in a shelter in the first place. I can imagine your stress level – and the vet bills. Going day by day is so hard. Keep us posted and hope you get some support from your readers. Thanks Liz. Your love and prayer is surely helping. Molly devoured her food yesterday and this morning — a wonderful sign! (Oh, and let’s not even talk about the vet bills… but she’s worth it, clearly.) xo!